PHOTO OF THE MONTH: Great conditions for an Autumn club run. CLUB LEAFLET: Click here for our latest six page leaflet in pdf format (revised April 2016). Stop Press Latest. Stop Press Latest..
* WEBSITE TO CLOSE. Due to difficulties this website has been closed and is therefore likely to shut down at any time. If you wish to copy and paste anything from it, please do so now. Thank you for visiting the Bury CTC website over these past 10 years or so. * Expanded version of History of Bury CTC available free in pdf format on request to John Butterworth. 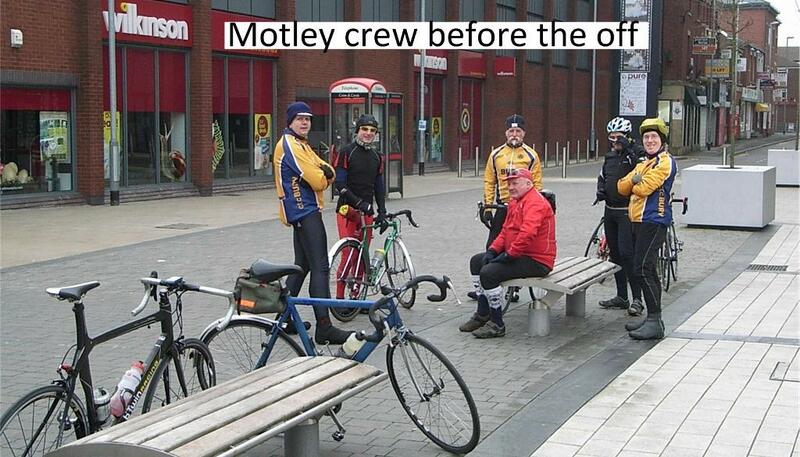 Bury CTC is an Informal Group belonging to Manchester & District CTC (formerly Manchester DA) - part of the national Cyclists' Touring Club (now known as Cycling UK) which encompasses six Groups or Sections around Greater Manchester and beyond including neighbours Bolton and Rochdale. 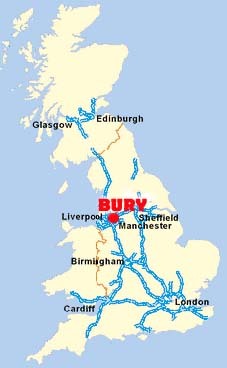 Bury is situated about 9 miles (14.5 km) north of Manchester city centre. Great cycling can be had in areas within easy reach, such as the Ribble Valley, Forest of Bowland, the Lancashire Plain, Fylde, Calder Valley, South Pennines, and the lanes of Cheshire. Our main activity is a regular programme of Sunday bike rides covering a distance of between 40 and 100 miles depending on the season and destination. We have two groups ‘A’ and ‘B’. ‘A’ group rides are for the fitter rider, ‘B’ group rides are at an easier pace. If you are a relative beginner, ‘B’ group rides are recommended. Experience has shown us that it is best that you don't join one of our club runs until you have completed a ride of at least 30 miles beforehand. Once you have attained this level of fitness you will get much more pleasure out of group riding. There is no charge and you do not have to join the CTC until you have had a few rides with us. Only after this do you need to become a member. Click here for how to join. We have riders out on a Sunday of all age groups - but mostly male, mostly old. However like most cycling clubs we particularly want to make welcome more younger cyclists and lady members. Whatever your age, if you enjoy cycling, have already ridden 30 miles, and want to meet with other like-minded people, you are welcome to join us on any club run. We meet outside the Wilko store at the east end of The Rock in Bury town centre. Every quarter we publish our list of forthcoming rides. Click here to see the Runs List. Also we hold a various programme of activities to promote cycling. These include camping, youth hostel weekends, cycling holidays and occasional invitation rides. As all our rides involve cafe stops we have included a list of cafes and tearooms visited. Click the link top left to see them. Please inform us of any updates, changes or additions. Every quarter we hold our Club meeting at The Trackside Pub, Bury where the runs list is planned and any issues raised over the past months are discussed. Everybody is welcome to attend, please come along. Click here for the date and venue of our next meeting and to view minutes of past meetings and to view the Secretary's reports. To view photographs of Bury CTC, past and present, click on 'Club Life Photos' and 'Photo Gallery' in the menu at top left. To view a short film promoting the joys of cycling with Bury CTC click the link below. To read something about the history of Bury Section click here. Click here to view the links page that connects you to relevant websites. For more details on Bury Section’s activities please contact John Butterworth, our Publicity Officer, by clicking here or by telephone 07963 701799. For details of all Manchester & District CTC activities visit the website click here. A winter Bury CTC Sunday club run about to start from the Rock.